NASA's LCROSS probe and its spent Centaur rocket stage purposely crashed into the large crater Cabeus Friday, Oct. 9, at 7:31 a.m. EDT (1131 GMT) in an effort to kick up lunar dirt to see what's in it. Scientists are hoping to see signs of water. Below is SPACE.com's complete coverage of the mission and related lunar science news, features and video - all on the heels of the exciting recent announcements that there is water in scant quantities across the lunar surface and tentative new evidence of water ice in shaded lunar craters. Follow the LCROSS moon crashes as it happened with mission updates from Spaceflight Now. WASHINGTON ? A NASA probe slammed into the moon Friday, blasting out a curtain of debris in which scientists hope to detect signs of water ice. A NASA probe that slammed into the moon's south pole Friday managed to spot the artificial crater carved into the pristine lunar terrain minutes earlier by its partner craft, but scientists have not yet confirmed if the two crashes kicked up a giant plume containing any signs of water ice ? a main goal. NEW YORK - Some observers hoping for a big blast from NASA's moon-slam experiment Friday were a bit disappointed. The moon is due for a double whammy from two NASA probes Friday, with scientists assuring some skeptics that smacking the lunar surface with spacecraft is really okay. A NASA spacecraft and its trusty rocket stage are drawing ever closer to the moon to intentionally crash to their doom Friday, all in the name of science. 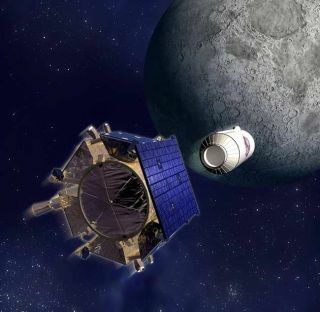 Scientists are hoping for a literal slam dunk with NASA's upcoming Lunar Crater Observation and Sensing Satellite, or LCROSS mission ? an event to be observed by a coordinated network of Earth and space-based equipment. Get ready for a unique cosmic collision! Early this coming Friday morning (Oct. 9), NASA's Lunar Crater Observation and Sensing Satellite (LCROSS) will end its mission with a bang ? literally. Many experts were shocked by the recent discovery of water on the moon, which was long thought to be bone-dry. But not everyone was surprised. A recent study actually predicted the water before it was found, and offers a novel hypothesis for its origin. The moon, so bright and large in the sky compared to other celestial objects, has captured the attention of humans at least since the dawn of consciousness. Over these eras, mankind's view of the moon has evolved, from the more mystical image of it as a god, to the thought it was covered in seas and vegetation. Most recently, it's been viewed as a dry and dusty wasteland.